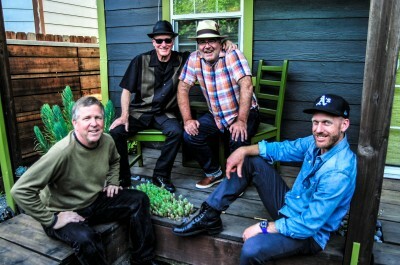 The Tamsen Donner Band, or TDB, was formed in 1996 and is made up of four Bay Area natives. From left to right it’s Jim Vermeys (bass), J.D. Dills (guitar), Chris Rogers (guitar) and Phil Coffin (drums).These players came together based on a common love for the music of Albert King, Muddy Waters, Willie Dixon, Jimmy Witherspoon, Robert Johnson, Charles Brown, and many more. Formerly the Tamsen Donner Memorial Blues Band, the current moniker was born out of the musical growth of TDB, busting out beyond the blues category with original songs that are difficult to categorize. While the blues is still a huge part of the band’s live show, the originals have really started to define the sound of TDB. Whether it’s a rollicking shuffle, a funky dance tune, a bluesy ballad, or a rocking instrumental, the energy is high, the sound is pure, and the passion is sincere. Tamsen Donner Band has recorded two CD’s: “Tamsen Donner Blues Band” from 2001, and a live show released in 2005 called “Tuolumne Blues.” The TDB song list numbers over 150, both original and covers. We hope to play for you soon!